Today's forecast called for a front moving in bringing with it chances of rain and storms. Jason and I had decided that if the weather was clear enough, we would go for a 3-mile run. Luckily, the front also brought in clouds and cooler temps. So it was only 70 degrees rather than 80 when we set out for our run at 11:30. In fact, it almost felt cold compared to the temps we've been having. We actually rocked along at a pretty good pace. The goal was not speed, but just to find a comfortable pace and go with it. The only downfall of the neighborhood runs (and sometimes it's actually a positive) is all the stopping you have to do at intersections. Even if cars aren't coming down the street, you still have to slow and check. And today, for whatever reason, there seemed to be high traffic, so lots of waiting. But, when we were actually moving...it was good. Definitely getting my running grove back. It's becoming more comfortable again. A lot less over-thinking going on. A lot more enjoying. We ended up getting 3.5 miles done just before the bottom fell out of the sky. Perfect timing. Though, the rain would have felt good, but it was a lot more than just a sprinkle or even light rain. The one thing I've noticed with my running, however, is that I am carrying a ton of tension in my right shoulder. Even carrying my water bottle in my right hand feels like I'm lugging around a 20# dumbbell. Any tips for loosening up? I keep trying to relax and exhale and drop shoulders, but I'm still doing something goofy. This is something I should have mentioned sooner - last week when I joined up. I have become friends with a lovely lady named Harmony. She blogs over at Keep on Keeping On. Her husband has cancer and they have formed Team Davis and paired up with Run Across America with Ulman Cancer Fund and Rev3 to raise money for cancer research. Teams are running from California to Washington, DC during a 21-day period (March 26-April 16) with the goal of raising $100,000 for the Ulman Cancer Fund. Harmony actually joined the team from California to Phoenix, AZ (you should check out her recaps). If you're a runner, you can contact Harmony (either go to her blog or the Facebook page for Team Davis) and join up and log your miles to help raise money. Or you can also donate under Team Davis. So while I'm not running any long distances right now, I'm logging as many miles as I can for Team Davis. I had Jason pick up sweet potatoes yesterday to go with veggie burgers tonight. However, I forgot that we were out of buns or even sandwich thins. So, I came up with two options: a hummus wrap with sweet potato fries or super loaded sweet potato. Jason chose the super loaded sweet potatoes. That was perfectly fine with me as it was an easier dinner to throw together. In honor of Taco Tuesday, I did go with a more taco-ish filling. I sauteed red onion and garlic then added in black beans, tomatoes (only had canned that I had to drain), green chile peppers, salt, pepper, cumin, cilantro, chili powder and red pepper. 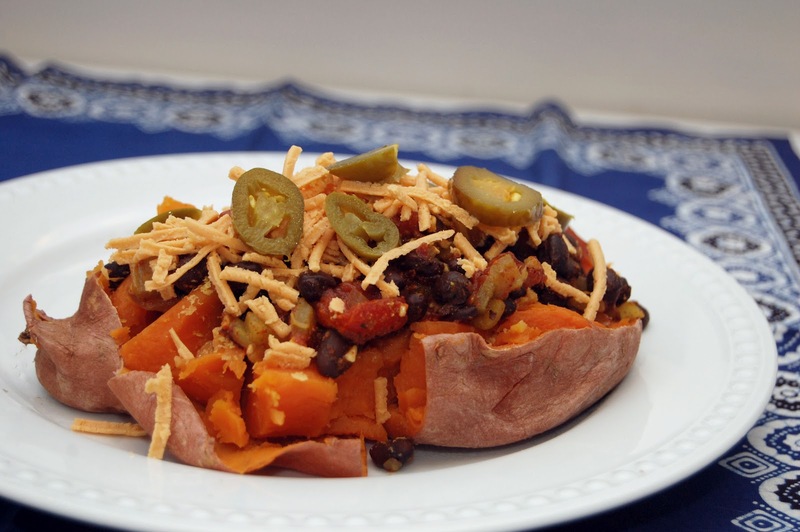 While that was on the stove, I just microwaved the sweet potatoes until tender then piled on the toppings. I also added in some Daiya Vegan Cheese and jalapenos. Super simple and filling. And, it almost looks like a taco salad.